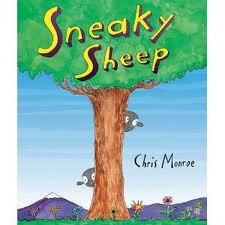 This week our BLG reader Maria brought in a fun read aloud – Sneaky Sheep written and illustrator by the talented Chris Monroe. Rocky and Blossom are two sheep among 147 others who are all watched over by Murphy the sheepdog in a large meadow. Rocky and Blossom are determined to explore the meadow on the mountain far away. Despite their sneakiest attempts at escape from Murphy’s supervision, Murphy always seems able to bring them home. One day however, they do manage to get away and are threatened by a wolf. Murphy turns up at a critical moment and helps them to safety. This story had lots of drama and funny bits but our classroom experience brought even more humour to the story. Early on in the story, there was a page that showed our two sneaky sheep juggling fire. Jacky in our class was convinced that the picture showed wrestling chickens. The rest of the story seemed to take on a completely bizarre twist as Jacky wondered if the wrestling chickens would come back. It was a kind of “you had to be there to understand” experience but I don’t know if any of us will ever pick up this book again without thinking about the wrestling chickens! Khai: I like the designs and drawings because it was colourful and really nice. I liked the part where the wolf comes and scares them because it was kind of funny. Catriona: The drawings were good but their sheep dog Murphy, does not look like a sheep dog should. Otherwise, it was a very funny and good book. This entry was posted in BLG Reads this week and tagged BLG Reads, Chris Monroe, favourite illustrators, fiction, great read alouds, picture books by carriegelson. Bookmark the permalink.